The question of personal identity and its duplication have been fascinating people for centuries. From Edgar Allan Poe’s “William Wilson” to Tchaikovsky’s “Swan Lake”, the theme has been pervasive in almost every form of art. When it comes to movies, such films as “Sommersby” (1993), “Face/Off” (1997), “The Prestige” (2006) or “Black Swan” (2010) may immediately come to mind. However, just recently, scriptwriters/directors have decided to approach the topic more directly, and we now see two films – Denis Villeneuve’s “Enemy” (2014) and Richard Ayoade’s “The Double” (2013) gracing cinema screens in the hope to awe. Although these two movies have their share of differences, e.g., “The Double” is far wittier and more satirical than “Enemy“, these two films share the same theme, and, therefore, it may be interesting to make a brief comparison between the two. Also, besides the “doppelganger” theme, what these two films also have in common is the relative novelty of the directors’ productions. 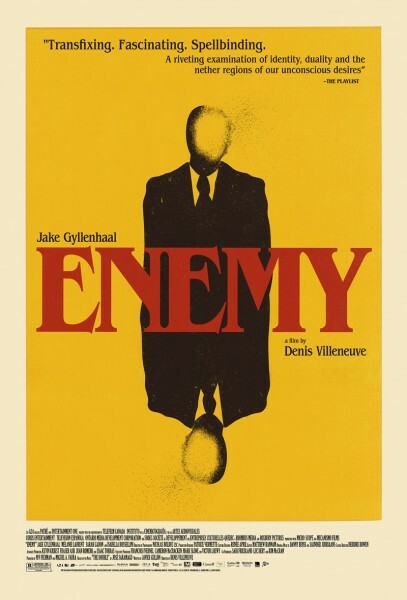 “The Double” is Ayoade’s directional debut and for Villeneuve, ‘”Enemy” is only his second truly mainstream movie after “Prisoners” (2013), also starring Jake Gyllenhaal (“Donnie Darko” (2001), “Zodiac” (2007)). “Enemy” is a Canadian film, an adaptation of José Saramago’s 2004 novel “The Double”. Saramago is a Portuguese novelist who is probably best known for his 1995 science-fiction novel “Blindness” (also a major film of 2008, starring Mark Ruffalo and Julianne Moore). “Enemy” stars Jake Gyllenhaal as Adam Bell, a History professor who seems to pursue something beyond the “ordinary” or human reach. After seeing a movie clip with his doppelganger in it, some actor named Anthony Clair, Adam decides to find out more about him. However, his quest for truth soon leads him to an unexpected battle with his double for the control of the situation. The film itself stays largely true to Saramago’s novel, although the ending in the movie could be fiercely criticised and deviates substantially from the book. Gyllenhaal also gives a mesmerising performance. Although “Enemy” may have borrowed its unusual style from Lynch or Cronenberg, the movie still manages to set its own pace and atmosphere due to its twists and a strong, eerie score. 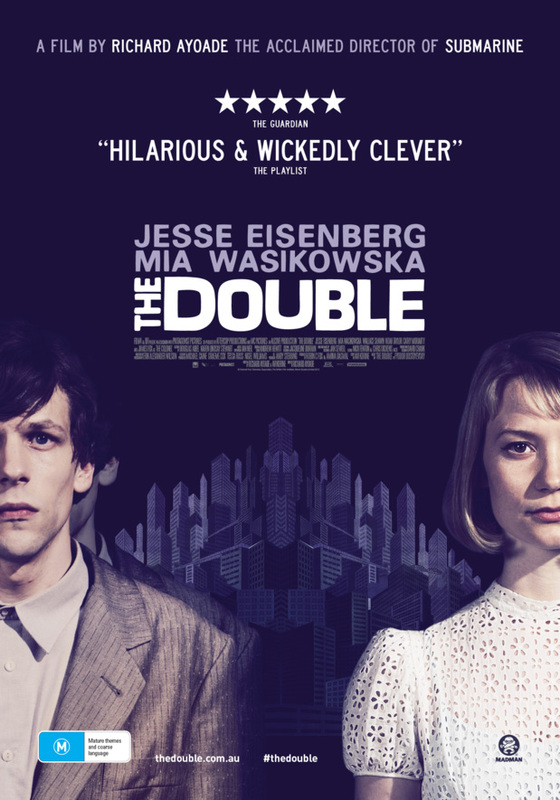 “The Double“, starring Jesse Eisenberg (“The Social Network” (2010)) and Mia Wasikowska (“Jane Eyre” (2011)) is based on a story by Dostoevsky. The film tells the story of a very timid office worker, Simon, whose life turns upside down when a new worker, James, is hired at his firm, and looks exactly like him. Although the acting is strong and the plot is enticingly fascinating here, it is the style and directing in this movie which sets it apart. However, “The Double” does not quite manage to build its plot to a truly twisty and unforgettable finale, although it has a lot of potential. Its grim comedy genre emphasises existentialism, making the movie a quite original piece of cinematography (together with its lightening devoid of any daylight). The original story by Dostoevsky is somehow different from the bleak and depressing image that the film displays: the original story does feature oddities and mental breakdowns, but, unlike the film, it features Russian traditions and cultural references. Moreover, in Dostoevsky’s novel, protagonist’s subconscious processes are more the result of his personal abnormalities, rather than random whims played out in the world, which has already been touched by chaos and existentialism as in Kafka’s novels. In that way, the film ‘The Double’ is much more Kafkaesque than “Dostoevsque”, although it is based on a story by Dostoevsky. The verdict? “The Double“ definitely wins when it comes to setting up an eerie atmosphere, theatrical-feel, psycho-social intensity, sublime messages and surreal production; but, despite its shockingly “lazy” and confusing ending, it is “Enemy” which has a deeper, more complex and entertaining plot of the two, and, most of the time, it is the substance that really matters. Excellent piece. I was a massive fan of Enemy and I’m hoping for more the same with The Double. Ultimately, it’s the concept itself that intrigues me, though. I love these psychological head scratchers. By the way, Ayoade’s debut was the little indie movie “Submarine”. Sorry if I sound pedantic but I only mention it to recommend it. It’s a great little film. Fantastic review. I have read José Saramago’s ‘The Cave’ and loved it. I’m curious now to read ‘The Double’. I haven’t had a chance to ‘Enemy’ yet, but I will do so very soon. Pitting these two films together was a great idea. Both films have a lot going for it and your review did both films justice. Thank you! 🙂 I haven’t read ‘The Cave’ yet, but I think I will like it too. Have you read ‘Blindness’? I think I like Saramago’s novels because they also remind me of Camus writings in a way. When I read ‘Blindness’, for example, I kept thinking about Camus’ ‘The Plague’. Only read ‘The Stranger’ by Camus. I should read more. My reading list is so long. I can’t keep up with the Pulitzer winners and all the recommendations mentioned on the blogosphere. Not only in your area… I guess it had a pretty limited release as it often happens with those kind of movies. Well, now Villeneuve’s movies are released worldwide! The Enemy was a nightmare… in a good way. I really loved it. I really like your writing style. I haven’t seen The Double yet, but I really enjoyed Enemy. Another interesting doppelganger film is The Broken. I think the 5.5 rating on IMDB is undeserved. btw; from an academic perspective, film titles should be in italics, not quotations marks. Quotation marks around a title are for short stories or articles within a larger published work.